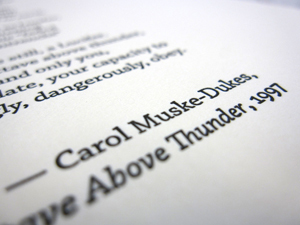 Letterpress-printed in an edition of 50 with hand-stitching by Amy Bouse (2009). The Al-Mutanabbi Street Broadside Project was started by San Francisco poet and letterpress printer Beau Beausoleil in response to the tragic bombing of that street, named for 10th-century poet Al-Mutanabbi, in 2007. A hub of artistic and intellectual activity in Baghdad, Al-Mutanabbi street is home to booksellers and cafes—a true literary community. The bomb killed 30 people and wounded at least 100 more, at the same time damaging countless works of literature and targeting an area known for the exchange of ideas. 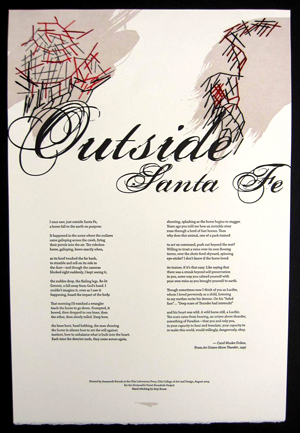 In collaboration with visual artist Amy Bouse and California Poet Laureate Carol Muske-Dukes, I contributed a broadside for Muske-Dukes’ poem “Outside Santa Fe.” You can view the Jaffe Center’s archive of the work, including artists’ statements, here. It was letterpress-printed in an edition of 50 on Somerset paper using photopolymer plates on a Vandercook Proof Press at Otis College of Art and Design in Los Angeles. Amy Bouse, a painter and fiber artist based in LA, provided vibrant stitchings on the surface of each broadside that reference the art of bookbinding and the way it binds together languages, and, by extension, peoples. 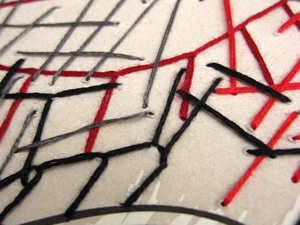 Each stitching has a life of its own–-suggesting in some cases a disobedient streak, a flash of lightning illuminating the storm, or an explosion, to name just a few possibilities. Because they are hand-made, each broadside is different, and thus bears the markings of an individual hand and mind at work on the page.